A brightly colored fake mission sketch. Everybody has some doodle they come back to when they are needing comfort in their sketchbook, and mine is drawing building parts. Call me a used-to-be-architect. Cubes and squares and circles and the symbol for earth (seen in ALL my doodles) is a constant because it is comforting. A stepping stone for the days when I am not quite there. 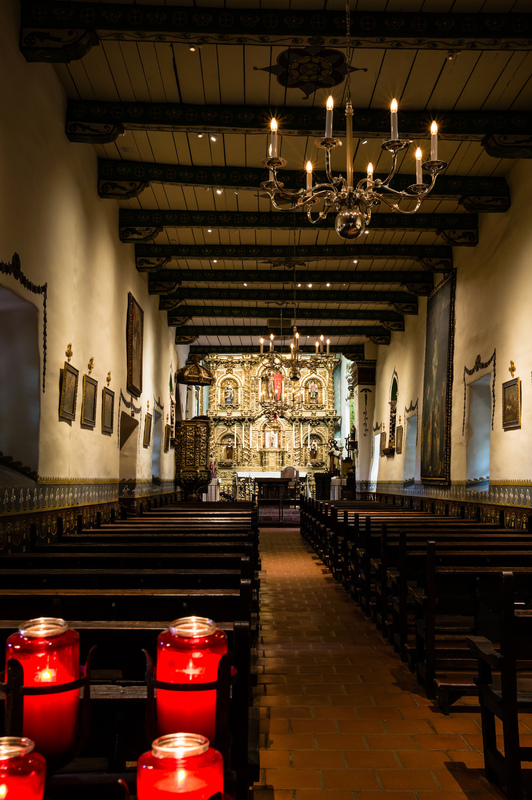 I was raised Catholic and my best memories of that religion were at the San Juan Capistrano Mission, mass said in mexican and latin, lighting the bright red candles, and sneaking a pat on Guadeloupe’s statue. Bright colors and the shapes. My mom and I often went to midnight mass on Christmas Eve. Another of my favorite memories was horseback riding with my brother Stephen next to the orange groves in Capistrano. So the smell of oranges and horse sweat and incense and salt air are all mixed in my memory or sepia tones and bright pink and orange and turquoise. Home. I’ve been drawing missions and barns this month, experimenting with mediums outside my comfort zone, and decided to share one of my “fake missions” with you, mission shapes that are from my imagination. I usually start with pencil sketches in one of my sketchbooks that are buried in a yarn bag next to the bed or sit at my work desk. I tend to work shapes out in pencil and pen, then move to color. Working in pencil on good paper. . . I ended up with this pen and ink sketch. Sadly the sketch was ruined. CATS! I switched to a shellacked watercolor block and sketched the shapes lightly. Pen color was applied then worked, as it didn’t soak into the paper. Q-tips move the color around and blend it. The color was still a bit pale; I let it dry. I added a second coat of pink, dabbing and moving the color. The piece is finished, but I added a bit more black to pop the shapes. Final Fake Mission: pencil and pens on shellacked paper. A total comfort, these drawings. Takes me home! 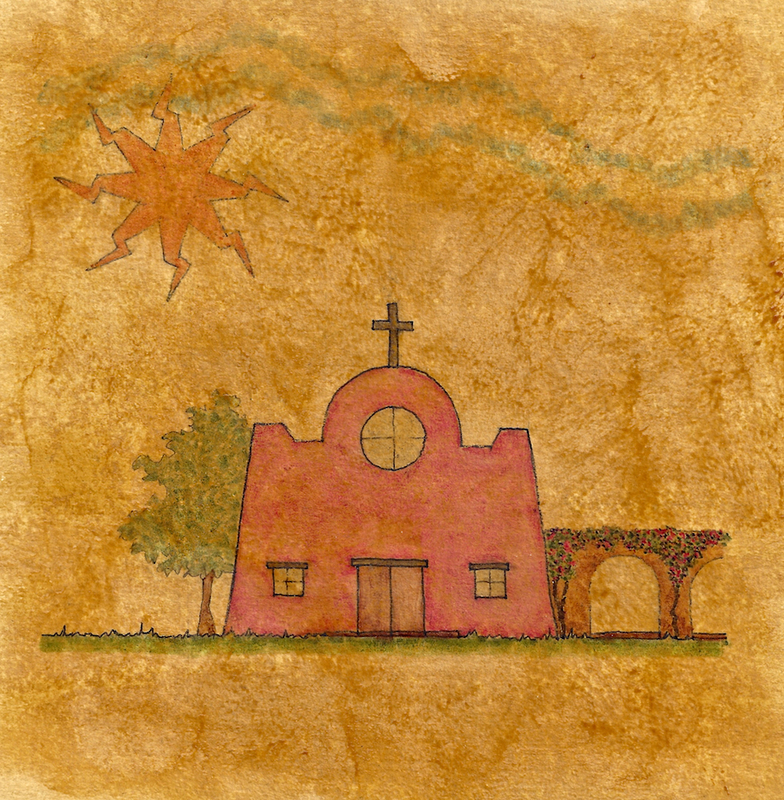 This entry was posted in art, autobiography, creativity, journal, process and tagged California Missions. Bookmark the permalink. 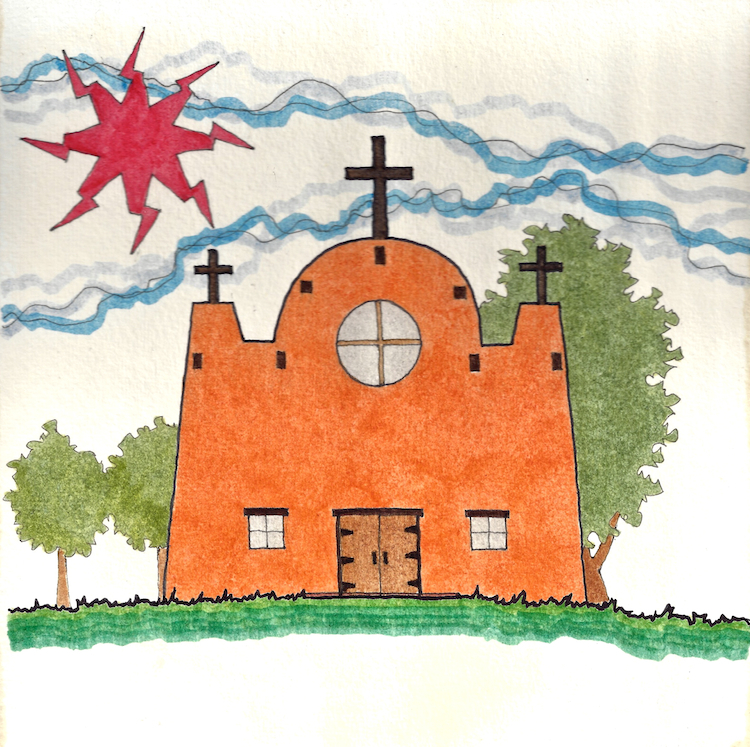 I grew up Catholic in California, too, Katie, and in this post you’ve really touched my inner child with the warm golden glow of your sweet drawings. Thank you! I am drawing all the missions right now . . . was drawn to them — no pun intended!